Blues manager Gary Rowett is hoping to complete his first two summer signings in the coming days. Nottingham Forest’s Robert Tesche is the subject of a £500,000 bid from Blues after a successful loan spell at St. Andrew’s last season and Swindon goalkeeper Wes Foderingham is in line to replace Darren Randolph, who moved to West Ham last week. 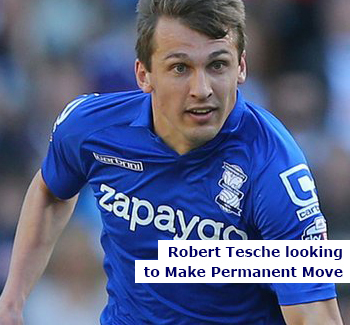 The move for Tesche is no surprise as Rowett made him a priority after the German became a hit with the Blues fans during the loan spell. The fee for Tesche, if agreed, will be the highest figure Blues have paid for a player in a number of years. The well documented financial problems of the clubs parent company are far from over, but a limited budget is available. Foderingham, 24, made 164 appearances for Swindon Town and has recently gone on record to save a move to the second city would be “massive”. The London born stopper is a free agent is likely to complete the switch early next week. The Sheffield Star wrote- “Jacques Maghoma – one of 11 senior players released by Sheffield Wednesday earlier this month – is on Birmingham City’s radar. Maghoma worked with Blues boss Gary Rowett at Burton Albion before moving to Hillsbrough nearly two years ago”. This entry was posted in BCFC News, Rob Wildey. Bookmark the permalink.